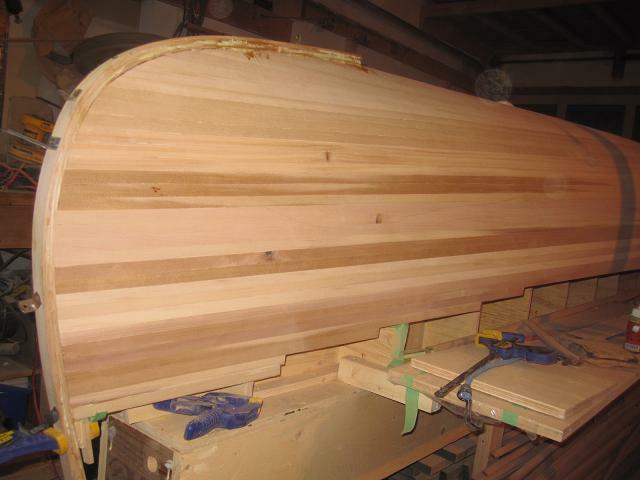 Canoe building factoid #3 — Your spouse’s appreciation for the canoe grows inversely to the number of times you invite her to look at it per day. it provides a hard edge that protects the ends of the boat. it hides the gnarly strip ends and the fact that you didn’t shape the internal stem properly. As opposed to the internal stem, the external stem should be made out of hardwood. I chose ash, partly because I bought so much of it and partly because I wanted my son to be able to tell his friends that he cut a piece of ash. 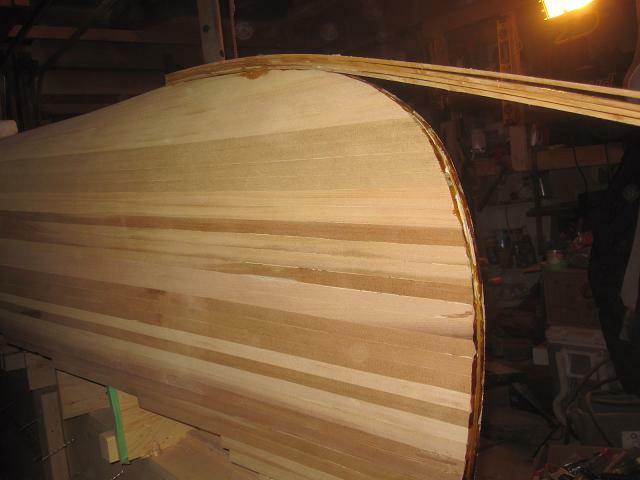 My son and I ripped several strips of about 1/8″ which I then laminated with Gorilla Glue and mounted on the boat. Given that I had lovingly soaked the wood in the tub (stopping short of adding my wife’s lavender bubble bath), it bent easily and without the use of clamps that made the internal stem shaping process look so impressive. I screwed it into the internal stem using drywall screws and metal brackets that I happened to find after cracking the stem despite having pre-drilled holes. Live and learn. With any luck, this side will turn out as well as the other side. You are currently browsing the preparing the external stem category at greybeard canoes & kayaks.